What does The Brothers That Just Do Gutters Franchise Cost? The Brothers That Just Do Gutters is a home services franchise that installs, cleans, and repairs seamless rain gutters and leaf guards. The cost to own this franchise requires a minimum liquid capital of $100,000. The total investment ranges between $108,000 and $170,000. 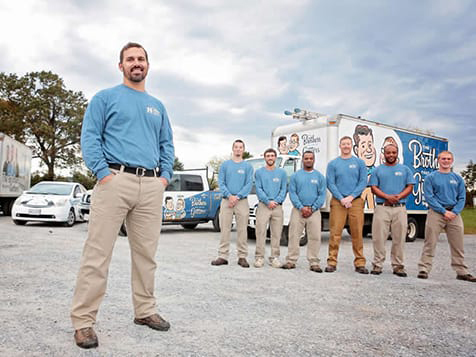 The Brothers That Just Do Gutters offers owners training, support, marketing and an in-house call center to schedule franchisees client appointments. The Brothers That Just Do Gutters: National Leaders of a Vital Niche Market. Founded in 1999 by brothers, Ryan and Ken Parsons, award-winning residential gutter contractor, The Brothers That Just Do Gutters has become a shining example of a well-planned and well-developed national organization - one that leads a very specific niche market and creates a tremendous business opportunity for entrepreneurs from coast to coast. Our company offers installation, cleaning, and repair of seamless rain gutters and leaf guards and we differentiate ourselves from other residential contractors by focusing on an often-overlooked aspect of our industry ... the customers. We treat each project as a unique opportunity to help homeowners protect their investment by providing trustworthy, skilled employees and quality products. The Brothers have structured our operating and support systems to ensure that our owners are managing their businesses rather than their businesses managing them. Our full-time in-house contact center not only answers all client requests through phone and email, but also schedules all appointments, which are then imported into the calendars of our franchisees, their employees, and their field workers. We also have a full-time in-house marketing team. When each new franchise is purchased, the team builds over twenty landing pages prioritized for the local market of that territory. These pages are then plugged in to share rank with our core website, which contains over a hundred pages of highly focused content and keywords, resulting in high search result positioning for the franchisee. The Brothers That Just Do Gutters is looking for enthusiastic individuals of all backgrounds who are committed to building a quality-focused residential service business in their community – people who are serious about taking control of their own futures and who can appreciate the advantages of a franchised system like ours. If that might be you, contact us today for more information.